Water is an important ingredient in making medicinal ingredients and making drugs themselves. Water used in the pharmaceutical industry must meet certain requirements so that it can be used in the drug production process. We sell Purified Water Systems, prepared with clean water generation systems and collected in purified water storage tanks of the capacity needed and distributed by centrifugal pumps for loop recirculation. At various points the heat exchanger used is a heat exchanger provided (if needed) to reduce the temperature of the hot circulating water and if needed. There is a back pressure valve on the back lane. Instruments and on / off valves for controlling and monitoring system operation and water quality. Our Purified Water System is controlled from a centralized control panel consisting of a PLC board. The distribution pipe consists of sanitary tubes, fittings, valves with orbital welding and triclover clamps in the manufacturing area and for instrument connections. Water through this pipe is supplied to various user points and spread back to the purified water tank that passes through ultra violet light which has a radiation dose of at least 30,000 μW-sec / cm. Construction materials for Purrified Water Tanks and distribution lines must be SS 316L. The filter vents in the storage tank must be 0.22μ and the water must be filled with a tank through spraying water spray balls on the entire surface of the tank. Dead leg can cause stagnant water causing microbial growth, so that the dead leg should be no more than 1.5 times the diameter of the pipe. The slopes throughout the circle should not be less than 10 mm / meter. There should be no leakage and pressure drops during detention times. Passivation of distribution loops must be carried out with 3.5% v / v nitric acid solution for a period of not less than 120 minutes. Therefore, PT. 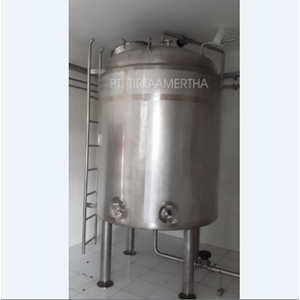 Tirta Amertha Sells Purified Water System which plays an important role in maintaining the quality of purified water. This must be maintained and validated correctly. The specifications of purified water based on purified water monograph (USP, FI, Europe Pharmacopeia) include description in the form of clear liquid, colorless, tasteless; free of foreign particles; total organic carbon (TOC) <0.5 ppm, water conductivity <1.3µS / cm, pH 5.0-7.0; free of microorganisms including E. coli, Pseudomonas aeruginosa and Salmonella and other bacteria should not exceed 50 cfu / mL.